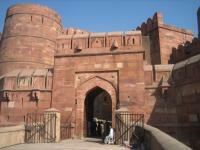 Agra Fort is a 16th century Mughal red sandstone fortress. The great Mughals Babur, Humayun, Akbar, Jehangir, Shah Jahan and Aurangzeb lived here, and the country was governed from here. It has massive red walls, with an outline of 2.5 kilometers. Within the walls, palaces, mosques and reception rooms can be found. The most beautiful parts were added in the 17th century, by Shah Jahan. 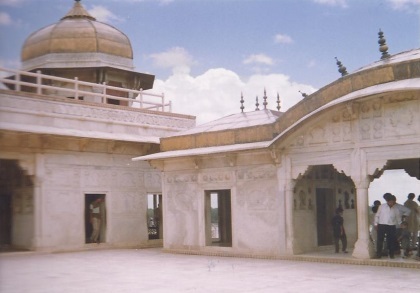 A lot of its white marble was used for the inside of Agra Fort too. The difference between the nearby Taj Mahal and Agra Fort is large: the Taj looks polished and clean, Agra Fort is dusty and sweaty. Similar to the Red Fort in Delhi but still worth visiting. I visited this WHS in December 2011 and was struck by the architecture of this site, especially the several arches adorning the courtyards. Beware of the seemingly innocent monkeys around the site. My camera zoom lens was split-seconds away from being bitten by one of the monkeys, but as soon as I was pressing the button to take a picture I noticed a sudden movement and luckily my instinct told me to move sideways. That way the monkey attack wasn't successful and instead I ended up with a very close-up photo of an angry monkey showing off its fangs! Agra Fort, an enormous red sandstone fortress on the bank of Yamuna River in the center of Agra. This fort is not just a military fortress, but also an imperial palace that was a power center of the whole Mogul Empire. I visited Agra Fort on such a very important day, the day that Taj Mahal celebrated her 350th birthday. The celebration for Taj Mahal, but Indians celebrated in Agra Fort! Why? The answer is Indian Supreme Court did not allow celebrating in Taj Mahal so the celebrations have to move to the Fort. I do not understand the logic, the court want to protect Taj Mahal, a world heritage site, but they allow a grand party in Agra Fort which also a world heritage site and should receive equally protection! When I visited, the Hall of Public Audience was full with electronic machines that will make light and sound for the party, a lot of chairs and many polices, it was a really messy place. Thankfully that all such mess was not expand to other areas, the palace was still amazingly calm and made my mood back to normal. The palace in Agra Fort can be divided into two sections based on material, red sandstone and marble. The red sandstone buildings mean they were built before Shah Jahan or early years of his reign, the marble means they were built by Shah Jahan, an emperor who built Taj Mahal. The marble sections are absolutely breathtaking with marble inlay with colored stone and the view of Taj Mahal is incredible made me understood how sad of Shah Jahan when he was imprisoned and saw Taj Mahal everyday, so close but can not go there. The red sandstone sections were mainly built by Akbar for his son, Emperor Jahangir, with superb quality of stone carving similar to Fatehpur Sikri. 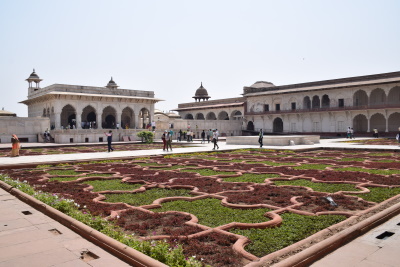 Agra Fort is a great place, the best place to understand how the imperial court of Mogul looked like as the lifestyle of each emperor can be seen in their private apartment. This place is a must for everyone who loves history and everyone who comes to Agra. One thing from Taj Mahal celebration, the old city of Agra was repainted in red colors, I didn’t know the city’s policy but if Agra wants to copy Jaipur’s Pink City tourist slogan and becomes Red City, I think they should invest their money that used for repainting on repairing roads in Agra’s old town which will make many tourists happier than seeing whole city in red! The Agra Fort - the second of the city of Agra’s main tourist attractions – was founded in 1565 and is a virtual copy of the Red Fort in Delhi. My understanding is that the latter is now also underway to also become a World Heritage Site, which is not more than fair. The Agra Fort is huge and still mainly occupied by the Indian Army. Its massive sandstone walls rise over 20 meters and 2,5 km in circumference. Inside the fort you find different palaces and semi-palaces, Harem quarters, Halls of Public and Private Audiences and everything else needed to run an Empire in 15th century India. And also the Musamman Burj, were the aging emperor Shah Jahan spent his last years and where he lay on his death bed, gazing at the distant Taj Mahal where his long lost love, Mumtaz Mahal was buried. The Agra Fort is an interesting visit but one can’t help that after having visited Agra’s major attraction, the Taj Mahal, it’s hard to see the same beauty in this still very exquisite palace. My recommendation when visiting Agra is that you FIRST visit the Agra Fort and then the Taj Mahal. Otherwise the almost unreal beauty of the Taj might distance you completely from what beauty the Agra Fort actually has to offer you. The above review is misguided and ill-informed. Without the formation of the Archeological Survey of India and the policies of Lord Curzon (Viceroy), the entire array of Moghul monuments at Agra would probably have been lost to us. 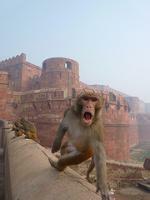 The crime at the Agra Fort is that the India Army are still using the Fort as barracks. This means the Moti Masjid (Pearl Mosque) is off-limits to visitors. A disgrace. Still the view of the Taj Mahal from Shah Jehan's quarters make the visit a joy. Harem: "North of this entrance sits the fort's largest private residence, the Jahangiri Mahal, built as a harem for Jahangir. Mughal Empire: The great Mughals Babur, Humayun, Akbar, Jehangir, Shah Jahan and Aurangzeb lived here, and the country was governed from here. 312 Community Members have visited.